Sales is like an art and artists (they may be rogues, charlatan, dream makers, seducers etc.) do their best when they are left alone with less supervision. I am not a great fan of detailed reports, daily CRM updation- opportunities, conversion rate etc. Let marketing guys take care of this analysis and devise marketing strategy and schemes accordingly. Sales meeting, once a week backed by strong incentives schemes, will do Company's revenues a lot of good than doing documentation of sales by salesperson. The underlying principle here is aligning core activity to the right person. As far as Salesperson is concerned, they possess different skills and work with different motives on the field. Sales person can be charmers, eager to win with everyone that they meet. There are salesperson who are good at building relationships, doing iterative meetings with clients. These people are good at selling services and products with a longer life cycle. 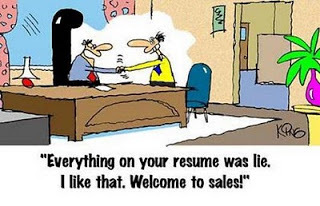 Some sales person are incentives driven. They cannot do sales until and unless lured by powerful incentive schemes and there are still others who does it for pure thrill of it. In the end, what enables a sales personnel to succeed is the ideal balance between who is he? and what he is being required to do?.